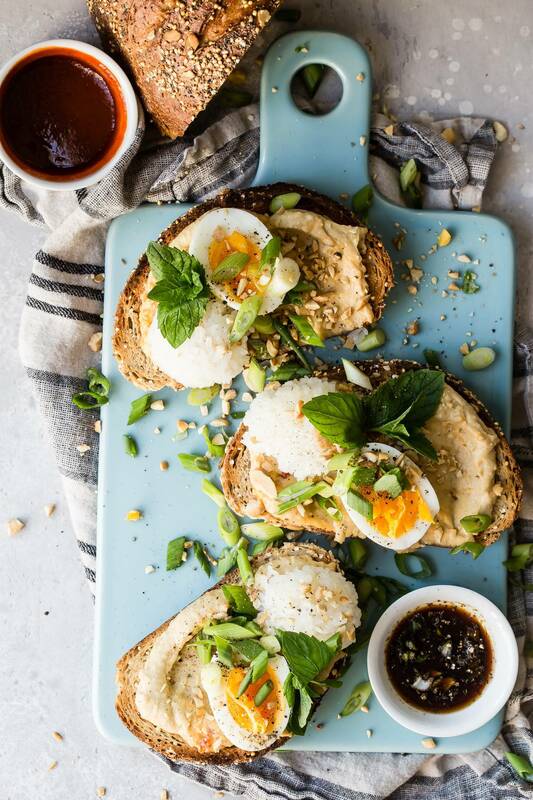 I combined some of my favorite Asian flavors for this epic hummus breakfast toast! The idea of having toast for breakfast has been around for years! But lately, it’s been elevated to a whole new status. Butter and jelly got pushed out for things like avocado and soft poached eggs and everything bagel seed! Yup, breakfast toast got fancy, and it’s not stopping. 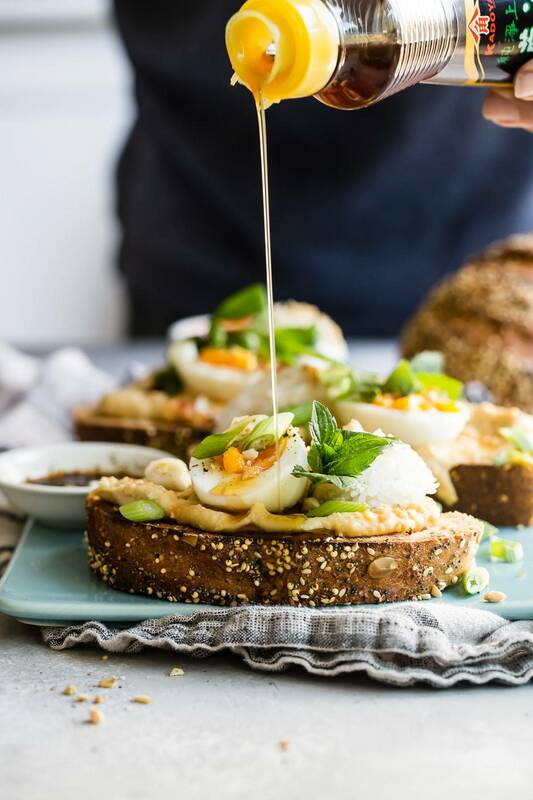 This hummus breakfast toast is proof of that! I know, not an avocado in sight, only thick, rich and creamy hummus spread on top of some of my favorite mixed seed crusty bread. 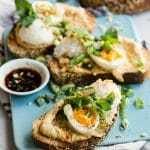 I went with an Asian theme for my breakfast toast which included a thick layer of Sabra roasted garlic hummus, a soft boiled egg, green onion, a scoop of boiled rice, fresh mint and a heavy drizzle of sesame oil. These flavors are by far my favorite in the world of food, especially the sesame oil! A little goes a long way so a really light drizzle is all you need. Hummus has so many great benefits that eating it for breakfast is a no-brainer idea! It’s loaded with essential minerals, high in fiber and provides so many daily vitamin requirements. Other important things to remember when making breakfast toast at home is to not skimp on the bread. Find the crustiest and freshest you can and make sure it has plenty of seeds around it. Once the seeds are warmed in the toaster, they’ll send out even more flavor. I recommend buying unsliced bread so you can cut thick slices for your breakfast toast. Keep the egg on the soft side. A foolproof way I have of cooking my eggs like this is to bring a pan of water to a full rolling boil and then carefully add the eggs. Set a timer for 6 minutes and let it come back to a full boil again. Your yolks will be slightly firmer than a runny egg but still soft. Run the eggs under a cold water tap and peel off the shell. 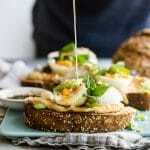 Poached eggs would be fantastic on this breakfast toast also! Add some fresh mint and a small scoop of warm boiled rice and you’re almost ready to start eating, but don’t forget that important ingredient in almost all Asian cuisine, sesame oil! All you need is a light drizzle over the toast, I love the smoky flavor that it leaves behind. Let’s kick breakfast up a notch, and hummus toast is the way to do it! This post was sponsored by Sabra! Check out these other amazing hummus inspired recipes I think you’ll love too! A delicious way to start the day! 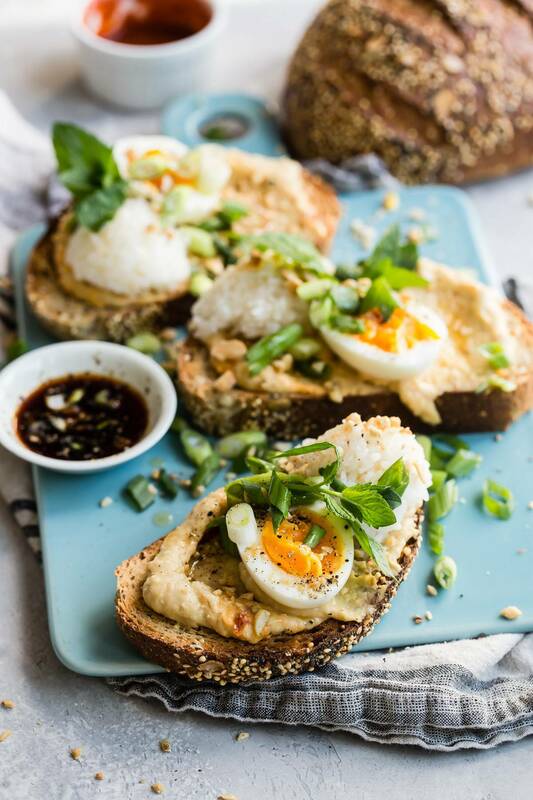 Thick slices of toast covered in creamy hummus, rice, a soft boiled egg and drizzled with sesame oil! Toast each slice of bread until golden brown. Spread a thick layer of hummus onto each slice of toasted bread. 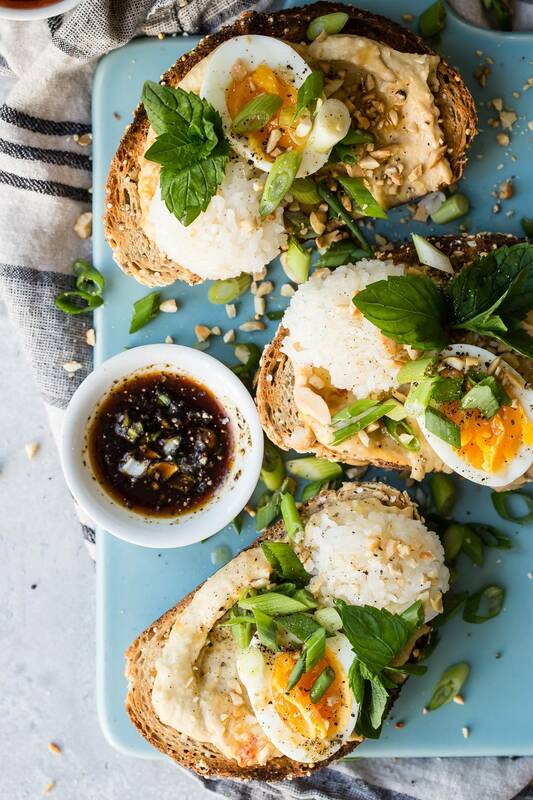 Place a small scoop of rice onto each toast. Top each toast with half of the boiled egg. Love that scoop of rice on there! So smart! These sound amazing – way to kick up hummus toast! LIVING for hummus toast lately!